Taiko is the Japanese word that literally means “Big Drum.” In Japanese culture, the taiko appears in Gagaku (court music) and at the summer Obon festival of lanterns. The taiko serves both to entertain and to teach the Buddhist precepts of ego-lessness and harmony. Taiko as a separate performing art form evolved only in the last 35 years. There is a spirit and energy from the drum that expresses the harmony of the players, the drums and the listener. At the Midwest Buddhist Temple, there are two ensembles that practice and perform this form of Japanese drumming. The Midwest Buddhist Temple Taiko Group was started by the Kinnara Taiko Group of Los Angeles in 1977 to bring Japanese American Buddhist Taiko to Chicago. A self-taught group, the MBT Taiko Group embraces the Buddhist concepts of harmony and oneness. The members come from many different backgrounds and come together as a temple group to perform at MBT’s Obon Odori and Ginza Holiday. The drumming equipment is made by the group from wine barrels and skinned with un-tanned cowhides. The music they play is from many different sources and groups—all committed to spreading this form of artistry. For more information, please contact the temple office at office@midwestbuddhisttemple.org or call 312.943.7801. Ho Etsu Taiko is a collective of musicians with a fresh take on the art of Japanese drumming. While respecting taiko’s rich traditions, Ho Etsu Taiko pioneers collaborations that push the envelope—with other taiko groups, musicians and culturally focused performance artists. Their deep Chicago roots ground their work in a variety of musical styles, from jazz to Latin and hip-hop. You can take in a high-energy Ho Etsu performance at MBT’s Ginza Holiday Festival and at other temple events. 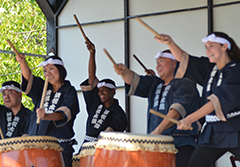 Additionally, Ho Etsu brings its unique brand of taiko to cultural showcases, festivals and private events around the Chicago area. Their philosophy is simple: Spread joy and vitality through each and every drumbeat.